The fundamental question needs to be answered: why organisational design? How will the business or organisations benefit by having a clearly articulated and well defined organisational structure? Does it not create slow and cumbersome work organisations where it becomes difficult to adapt to an ever changing working environment where we all compete and needs to be agile when capturing the attention of an increasingly demanding and sophisticated customer base? Indeed, this can be the case. Especially if the organisational structure does not truly fit the environment or the work it needs to produce. Leadership is responsible for the requisite structure of a business but rarely spend enough time on this science. Design therefore mostly becomes a reactive process responding to noise in the structure versus a proactive forward looking design to make the “form of the business fit its function”. For the purposes of this discussion, organisational design is defined as a deliberate processof configuring structures, processes, work outputs and eventually reward systems, and other people practices to create an organisation that is capable to achieve the overall business strategy. In order to be effective, senior management (executives) embark on a decision-making process which will have far reaching impact on the ultimate shape of the organisation. It is therefore important to make sound decisions from the beginning, necessitating a theoretical framework and business architectural model to guide the process and to assist at critical junctures. In driving organisational design and performance the Business Architecture Model (BAM®) protocol can be used to act as an overarching design framework that encapsulates the connection and integration of how strategy drives the business eco-system across all functions of the organisation. The model describes the strategy’s connection and impact at the transactional and data management levels – driving a network of accountability and decision making. 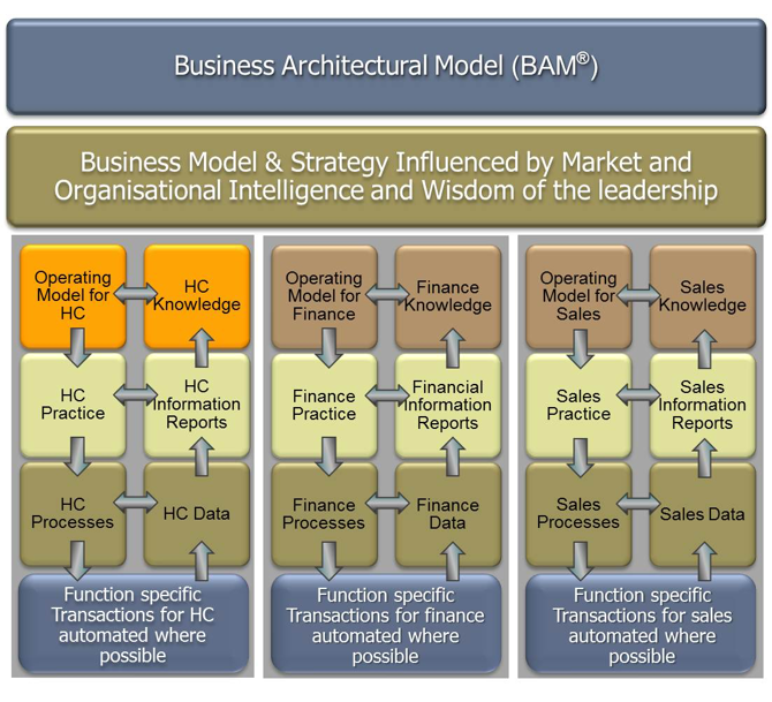 The Business Architecture Model (BAM®) shows the different layers of operational complexity of any function in any organisation (operating model, practice, process, transactions, data etc.) and the core and support operations which are usually dictated largely by the organisation’s size and the type of business they do. The key challenge in business, and one of organisational design, is to integrate these functions to deliver as a whole. 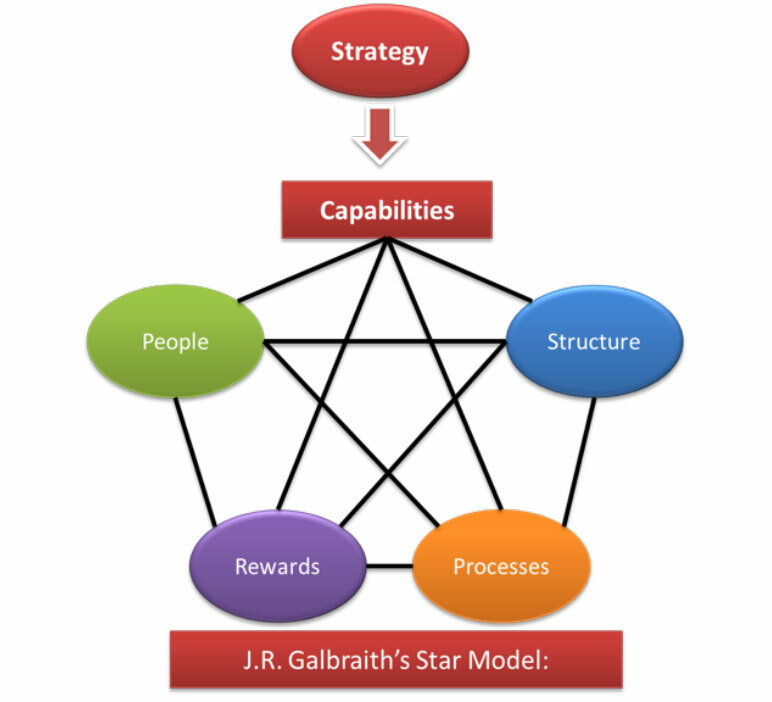 This model forces executives to have agreement on operational models in functions like Human Capital and Finance. Achieving alignment and integration in purpose, process and desired outcomes will resolve conflicting business processes or philosophies that so often cost millions of rands to address at lower levels in the business. BAM®reflects the vertical capabilities in two sets. First classic service types like Finance, Human Capital and Information Technology that can indeed be placed in a shared service centre but still has own requirements for maturity. The second, core business type can be defined as vertical communities. These can vary based on product/process/client (customer) strategies influenced by market competitiveness, market share pricing, geographical location, etc. They are fundamental choices. Horizontal communities and capabilities are about communities of practice, networks, teams, etc., some are formal, others informal. These are the most important strategies to assist in conflicting design criteria and are discussed in more detail later on.Suffice to say that vertical is always KING. Horizontal is a compromise, but never the less equally important as it creates the glue in a business. Every design is a compromise at some point. No design is perfect. The challenge is to understand the compromise the design is reflecting and why, followed by creating sub structures that mitigate the risks created by the compromise. 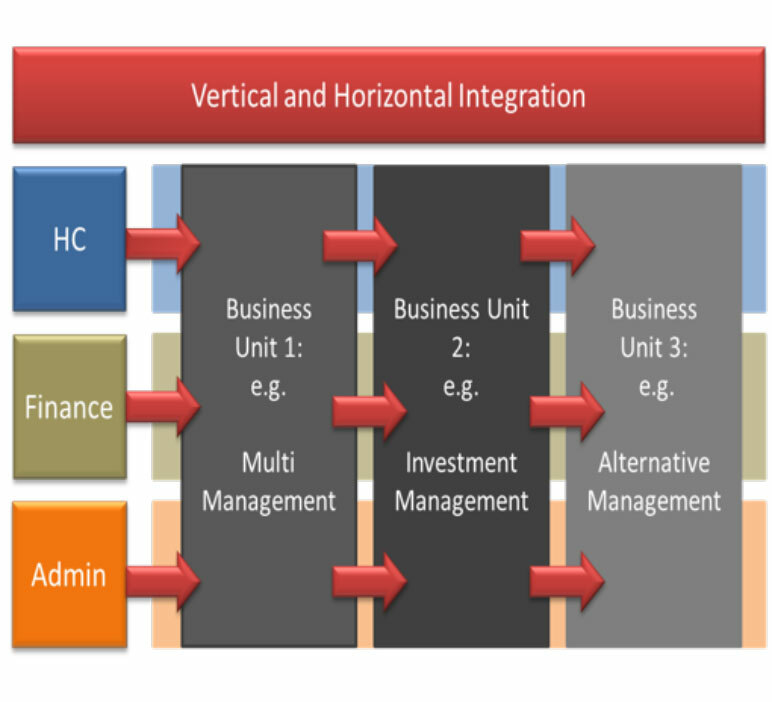 The horizontal functions are typically shared between different organisations, whereas the vertical functions are more unique and specific to the business’ strategy and model. When two organisations merge, it might be easier to find communalities between the horizontal functions, especially if they are governed by external standards such as Finance, and a greater challenge to consolidate the vertical functions. Even with a framework and model in place, the question remains, how to make the important decisions that pertains to a new organisational structure? Many leaders still make design decisions based largely on individual experience and observation. The experience might pertain to a specific environment, making it difficult to understand the realities of another business which could easily result in power struggles. A point of reference would be to suggest that the senior management team responsible for the merger share an agreed understanding of what organisational design means and that they identify a model and framework to guide their decision making. In attempts to understand the meaning of organisational design, there is often confusion between the organisational development and organisational design. Many times the words are used synonymously (wrongly). To distinguish between the two are important as it impacts on the decisions that will be taken later on. Both ultimately serve the same purpose: to harness and direct the energy of the people who do the work. Organisational development’s concern covers one aspect of organisational design: people. Thus organisational development is concerned with the development, design and alignment of people practicesto enhance the organisation’s effectiveness and the functioning of its people to an optimal level. Whereas the people aspect is oneof organisational design’s building blocks. These two constructs are also different in terms of application. Organisational design focuses mainly on the design of the business to function optimally in the market. It thus concerns itself with the architectural model of the organisation, the organisation’s collective capabilities, structure, processes, work and people to realise its strategy and organisational goals. With agreement and understanding of the definition, model and framework that is going to drive organisational design, the question can now be asked: whenis the best time to apply organisational design? Different senarios will dictate the most appropriate time to apply organisational design. Logically it makes sense at the inauguration of a new organisation. In existing organisations, not all new strategies require a new organisational re-design, but when the work required in an organisation changes, it will have an impact on the design of the organisation. Thus, if the work changes fundamentally, the organisation may have to transform into a new type of business with a different architectural blueprint. Likewise, if the strategy changes fundamentaly it might be necessary to develop a new organisation within an existing organisation. Various factors influence the ‘optimal’ and most appropriate organisational structure for business success. Strategy in a new organisation or fundamentally changed strategy for an existing organisation, is the key starting point. Understanding the organisational capabilitiesneeded is necessary to translate the strategy into design criteria. Capabilities are used to identify a series of decisions and options avalible to the business in the organisational design decision-making process. In order to differentiatea business, organisational capabilities need to be a combination of the skills, human abilities, processes, and factors that diferentiatethat business from others in order to identify its competive advantage. It is unique to the organisation, developed internally and cannot be ‘copied’ by other companies. If the organisational strategy and purpose changes, it might be necessary to re-evaluate the capabilities needed to fulfill the new strategy. The manner in which the organisation chooses to compete influences the capabilities needed for success. For example, what will be the greatest differentiating factor for the manner in which business is conducted? Will it be a marketing and distribution capability, product innovation, the capabilities of staff, or customer orienation – to name but a few. Each one may have its benefits but to some extent they contradict. These contradicting capabilities need to be woven into one organisation – this is core design. The overall purposeof the organisation will lend itself to more and less appropriate structures. Think of the structure of the business as the skeleton of the organisation, providing strength to support the ‘body’ and protecting it from outside forces. The stronger the stucture, the better it functions. The units formed within the business creating the organisational structure hierarchy are typically based on the the functions needed as well as influenced by geographies – where the business plans to operate, who their customers are and what they will produce (service/products). In most cases a variety of structure format possibilities exist to organisations with the same purpose. Although some might be more appropriate than others, the challenge is to choose the best fit to serve, build and preserve the organisation now and in the future. The structure serves additional purposes, such as determining where formal power and authority is located and sends a clear message in terms of the type of work the organisation values most. A mix of the organisational building blocks (function, product, geography and customer) can exit within an organisation and be built apon as extension is required, especially for inaugural businesses. It is therefore important to get the structure right in order to align the other design elements with the strategy. Accountability is embedded in structure and links to ownership of and relationships between processes. Clarity on accountability aids in avoiding overlapping roles and identifies gaps in the structure itself. It also becomes a link to reward systems and other elements in people practice referred to later. Structure by definition creates boundaries. In organisations where groups exist according to a certain logic, borders are naturally created between those whose logic differs from one another. As such it can become increasingly difficult to interact and collaborate across these precincts. These ‘silos’ created by function will always exist within organisations, the challenge is to make provision for and accommodate the flow of information and accountability, especially if the strategy requires a high level of collaboration and interaction across the confines of internal bounderies. Lateral connectionsand processesare the design mechanisms that can be used for integration purposes. Designing the process correcly ensures that a series of activities are connected that provides information up and down and across the business. Various types of processes can be identified such as managerial (sales forecasting and planning, price identification, capacity management, standards development, sales forecasting, portfolio management and conflict resolution) and work processes (product development, order filling and deal closure). Roles need to be clearly articulated and associated responsibilies asigned, especially where ‘overlap’ exists between processes. This step is essential for the design of effective and efficient processess. A guiding principle is to identify the optimum level of integration needed by an organisation that will empower units/functions to work together. Various design options are availble in this regard and once again focus should be directed to identify the most appropriate application/s. Networks:webs of interpersonal relationships that employees form across organisations and serve to coordinate work informally. Teams:cross-business structures that connect people to work independently and sharecollective responsibility for outcomes. Integrative roles: provides a higher level of coordinationthan teams. An integrative role is a full-time manager charged with orchestrating work across units. A customer relationship manager and a brand manager are examples of integrative roles. They have accountability for results but do not directly manage the resources they need to achieve results. Fully flexed matrix: a set of dual reporting relationships used to balance two or more dimensions in an organisation. Individuals typically report to managers from different units, but these employees are expected to jointly agreeon objectives, resolve conflicting priorities, and manage shared resources. It is important to design and manage lateral connections in order to increase an organisation’s ability to respond to challenges and opportunitites. The manner in which employees are rewarded sends a clear message related to the kind of work the organisation values most. A well defined and thought through reward philosophy of total compensation identifies how the organisation can best measure andrewardthe most important behaviours, values and actions. The levelat which results and behaviours are rewarded. Thus, should it be based on team, unit, division, departemental or organisational performance? At what level in the organisation are these decisions taken? Which one will make employees feel that they are being measured on the outcomes of their actions, work and decisions? The locus or place of measurementthat determines the most appropriate configuration of profit centers. Thus, who is reponsible for the business results: the product, customer, or geographical unit? Who is given credit and how can it be done in a transparent and accountable manner? Which behaviours and actionsare essential to support the strategic outcomes and how are they acknowledged in the performance management process? Do these behaviours and values reflect the organisational culture? Who takes responsibilityfor the assessment of performance? Do other performance measures play a role such as peers, direct reports, customers, employees from other departments? Essentially, what can be done to optimise the objectivity of performance evaluation? Chosing the most appropriate reward in relation to pay and making decisions on short and long term incentives. A distinction exists between compensation and reward. Compensation is used to pay employees for time and effort contributed to business success and to acknowledge and reward past results, to motivate future performance and to retain employees. A balance needs to exist where rewards and recognition is linked to compensation and where reward can be used with a lot more flexibility to align behaviour to expected outcomes. It is thus important to chose the most appropriate reward in relation to pay and decision making on short and long term incentives. Organisational values and culture all employees need to uphold. Behavioural and functional competencies that will support the development of human capabilities. Leadership philosophy to be used in decision making and managing staff. Reward standard to measure the success of outcomes. Strategy to measure and reward staff. Critical knowledge to be cultivated. Provides a vehicle for delivering organisational strategy i.e. framework for achieving strategic objectives. Drives market competitiveness and enhances organisational flexibility in light of economic pressures, thus providing an opportunity to differentiate the organisation from its competitors. Provides mechanisms to monitor and manage business performance. Allows decision makers to evaluate possible outcomes, understand root causes and make the right adjustments during implementation. Ensures organisational sustainability through the identification of organisational capabilities that allow the organisation to gain competitive advantage. Ensures optimum cost management in terms of labour efficiencies and de-bottlenecking of work processes. Ensures business alignment i.e. alignment of strategy, structures, processes and practices across the business. Provides an opportunity to influence organisational culture indirectly through the cumulative design decisions and the leadership and management decisions that are being made during the process. Clarity of relationships with external stakeholders to the organisation. Defined centralised and decentralised activities. The location of value chain processes and their expected outputs. The location of management processes and their expected outputs. Clarity of profit and cost centres in the organisation. Interpreting management philosophies into how the organisation should work; this leads to the desired culture. An appreciation of the different levels of leadership required in the organisation. The design process is an involved and often complex exercise. The following lists common mistakes to be avoided. Lack of focus on holistic change management process. Attempt to design organisation in silos without regard for whole. Only focus internally on design process without regard for external environment. Design targeted at wrong levels. Methodological design inconsistencies across organisation. Insufficient business acumen in development of organisational design which results in a lack of credibility. Lack of buy-in from key stakeholders and drivers within organisation. Lack of communication plan for implementation purposes. Change effort not targeted at correct level within organisation. Lack of regard for supporting mechanisms and potential conflicts. Design for people instead of for business. Moving deck chairs on the Titanic – designing with no real impact on business. The alignment of the components discussed thus far is fundamental to the outcome of the design process. Each should be well thought through and is meant to support the strategy. The more the structure, processes, rewards and people practices are reinforcing the desired actions and behaviours, the better able the organisation should be to achieve its goals. Equally important is the ability to re-alignas market conditions and internal and external requirements change. The configuration of resources, the processes used, and the mental models (BAM®) that contribute to current success will influence the plans made for the future. Thus in times of stability, efficiency is created, but in times of change, static alignment can become a constraint. The more rapidly the organisation can be re-aligned, the faster leadership can change direction and execute new strategies and opportunities as they arise. Therefore the flexibility to recognise and respond to opportunities and challenges is a necessary requirement for continual and effective organisational design.